loss has resulted in a truly dynamic, affecting sound. 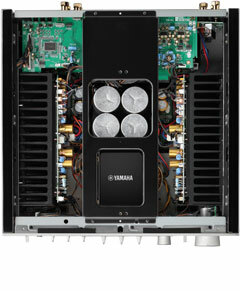 amplifier — resulting in sound with a superior signal-to-noise ratio and superbly well-defined sound field. The A-S2100 has achieved a fully discrete configuration during tone defeat by thoroughly separating the tone control circuit from the signal system. This not only increases response, but also improves slew rate and results in high range reproduction of greater vitality, richness and smoothness. Signal transmission and amplification features fully balanced transmission for thoroughly balanced operation, even of the control system circuitry. Signal loss through transmission has been significantly reduced through the application of screw clamp connections and thick cables between the preamp and power amp units. 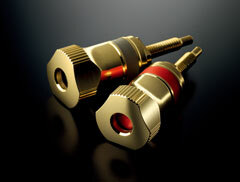 This is vital for signal transmission between the power amp units and the power step to the speaker terminals. This improves the damping factor and improves driver capacity and damping power of the speaker, resulting in vibrant and powerful bass reproduction. 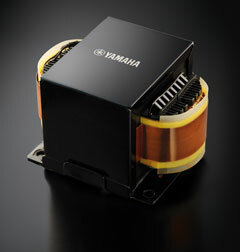 We’ve utilized a high-quality digital volume control, specially designed by New Japan Radio Co., Ltd., which consists only of ladder-type resistance, removing the impact of slew rate decline or coloring of the sound, delivering higher purity in the sound and excellent, fast response to large volume changes and steep transients. Moreover, the tone controls employ a triple-parallel method, minimizing the detrimental impact on sound quality seen with straight-line tone controls. In addition, the bass, treble and common circuits each utilize simple construction in which the NFB of the amp is not used and the CR elements are simply fixed in a straight line. This ensures exceptionally pure sound reproduction, even when tone control is applied and super response to audio signal transients. 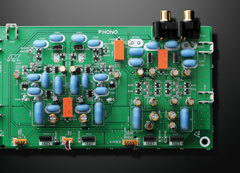 When tone defeat is applied, straight signal flow from only one volume circuit to a discrete configuration buffer amp is realized. The A-S2100 employs an original EI transformer, carefully customized for optimum compatibility with the chassis. Combining four large capacity carbon sheath block capacitors delivers an energetic sound — even during high volume — that is possible with the A-S2100. Moreover, since the control amp and control system is equipped with 12 shunt-type local regulators that prevent deterioration caused by currency fluctuation, a clean and stable power supply is achieved. The EI transformer is mounted on the chassis using a brass washer, restricting internal vibration that would result in noise.